High waisted cut trousers, straight, and very flattering to the women body. The pants are sewn of fine quality cotton fabric with a little lycra for maximum comfort. And have a wide waist belt that helps pack and flatter stomach area. The pans sealed with metal zipper on the side. 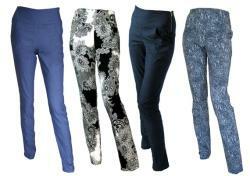 I recommend to wear the pants over a shirt or tank top and combine with stilettos for a polished-looking. This pans is very flattering to various women and sizes. You can order this in a lot of sizes: 36-48 euro / 6-18 usa / 8-20 uk / 10-22 aus. Fabric: 97% cotton, 3% lycra. Machine wash inside-out at 30 degrees (30c / 86f max).